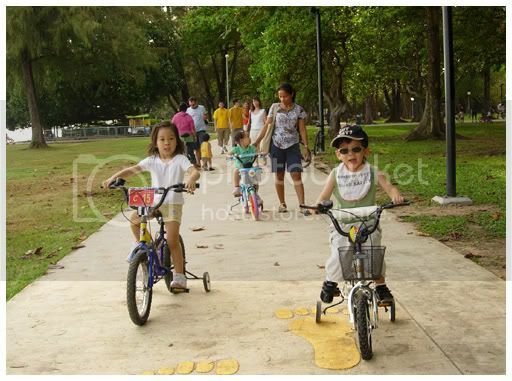 Great weather today so we decided to head down to ECP and let… - A mummy's inane blabberings..
Great weather today so we decided to head down to ECP and let the kiddos enjoy themselves..
Aidan's first time on his bike outside our condo compounds.. 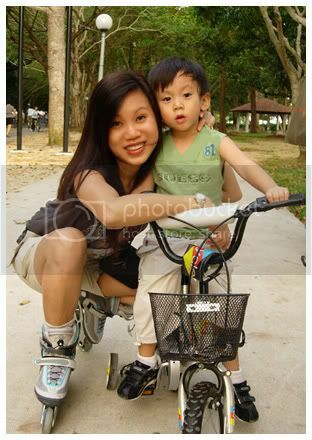 The boy was so happy and cycling abt at top speed! 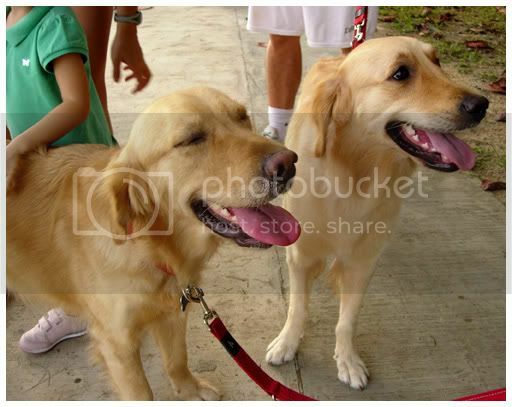 We met hub's colleague and his wife and their 2 kids - Mia & Whisky! Strangely, Aidan wasn't afraid of them. 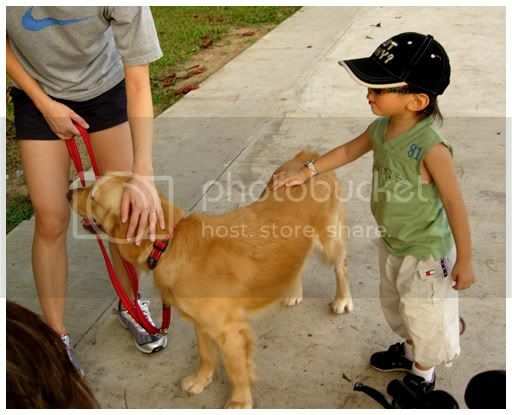 He's usually quite frightened of big dogs..
Gawd..don't think I can eat anymore yusheng! Can't help it that each time we have lunch with our clients, it's a must to 'lo'! Gets quite jelak after a while.. Gained about 3 kg during the festive period *awk*.. Am hoping to start jogging soon although I'm not exactly sure when I'll actually start. Hope it's not gonna be a case of me being nato..! I'm fine with blading long distance but running is a totally different matter. Just running after Aidan gives me heartburn! Will probably start with a really short distance and hopefully this year, I can try out for one of those marathons...(okay, by writing this down, it should make me more determined & discplined..well, let's see lah).. 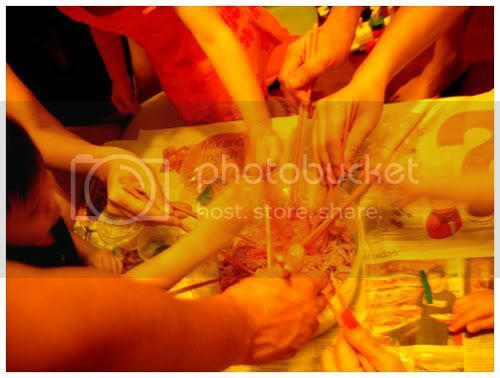 Some pics taken when our good pals came over for dinner at our place..
you really made a lot wor... $400! Wah, giving Aidan a good start I see with a shi san yao hand. heh..that's the best combination ever mah!! Happy New Year! U havent posted Erin's pic for quite a while! 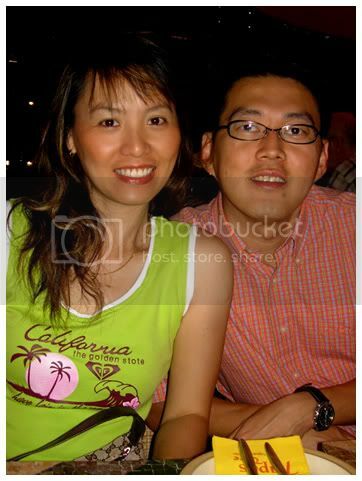 i thought he looks quite bad-boy in the first picture with his buey-song shades-totting look. 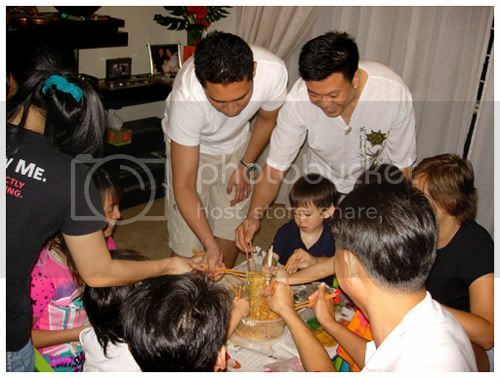 the picture with the dou-sum (gambling god) image cements it... Aidan, the bad boy... no wonder all the girls like him... girls like bad boys!! 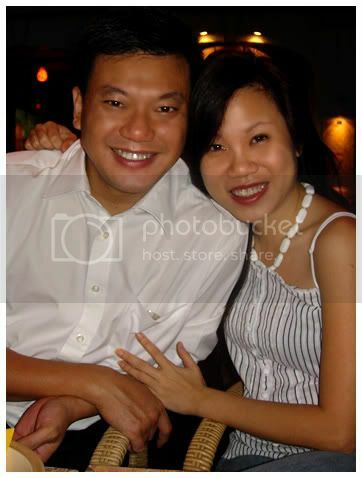 i have to agree..i always think he has this samseng look! very cheeky looking! 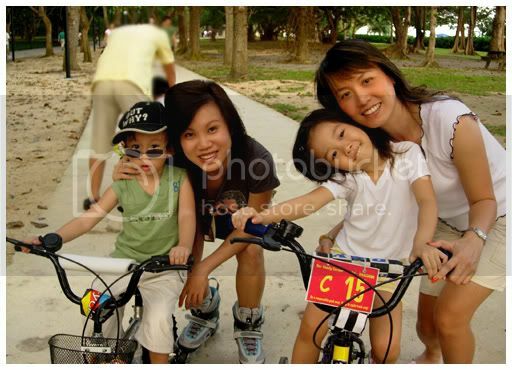 Eh was at Ecp jus now too! Saw the two dogs, but didnt get to bump into you guys. haha. mebbe we'll see u the next time we're there! I lost at mahjong... less than $5 coz we only played 10ct, 20ct. Playing with you sure stress one! aiyoh.so cute the dog in ur user pic..! But Andrew is okay with other dogs? wah play 10c/20c i probably will fall asleep. no kick leh! 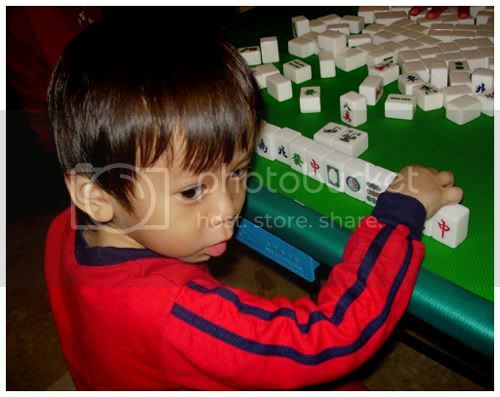 Wah lau, you sure are a mahjong queen! What kind of stakes do you play? Aidan look super sey in this first pic can! wah! 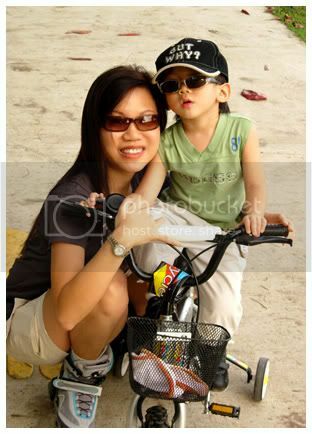 aidan looks damn cool in his sunnies! and playing shi san yao some more wor!!!!! if i plan to teach him mj...must teach him the best way to win mah! 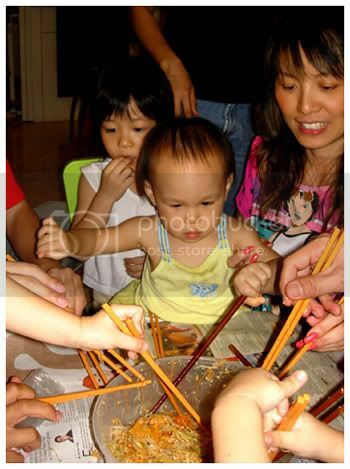 they do serve yusheng in chinatown right? 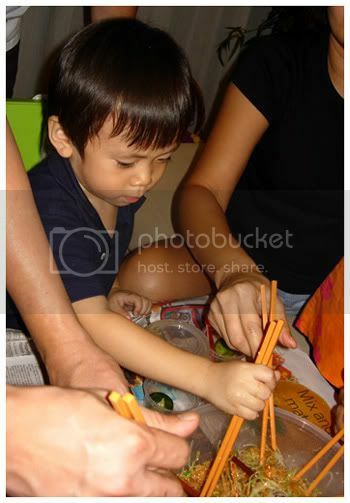 was looking at your blog photos of aidan coz i'm desperately looking for pictures of little kids doing certain activities for my final year project. am just wondering if we could take some of your photos, e.g. the 2nd pic of him cycling? feel free to contact me if you want to know more about my project at zixian1@hotmail.com.